Australian RESET Nation Challenge winner Pooja De Silva has changed her life and is now using her incredible journey to inspire others. 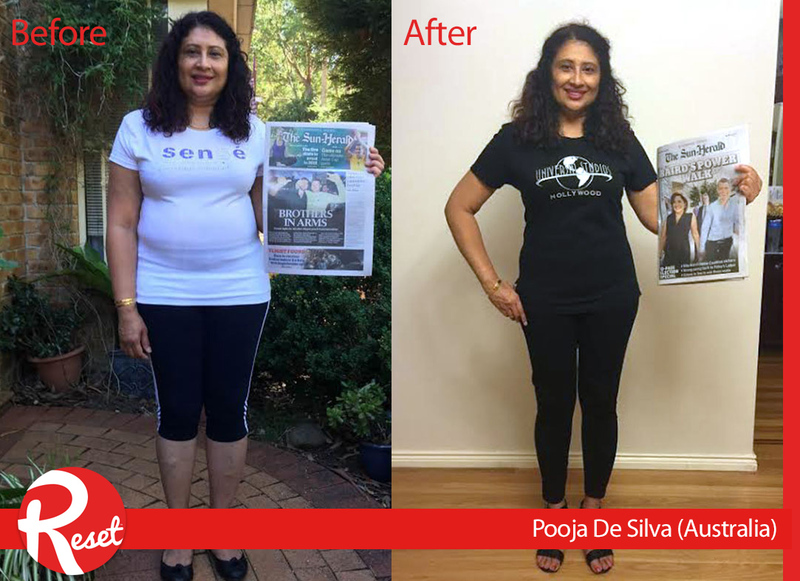 Throughout her journey so far Pooja has lost an amazing 26kgs totaling up to 32.13% body fat. Her blood pressure has also returned to a healthy level and her cholesterol count has dropped from 6.7 to 3.7 - overall, fantastic results. So what inspired Pooja to make a change? “Over the past few years, excess amount of kilos have crept in resulting in unwanted weight gain, which was considered to be a significant health risk,” she said. Prior to the RESET challenge, Pooja had followed countless diets, which had given her “no real results”, so she decided to take part in the RESET Nation Challenge to improve her health and wellbeing. “RESET is a unique weight loss program that I have trusted and thoroughly enjoyed from day one,” she said. Pooja said during the challenge she exercised hard and smart with her Personal Trainer – Scott Lawrence, “who continuously raised the bar high in my training sessions each time we trained, and I enthusiastically looked forward to my weekly weigh-in sessions”. “Initially, I found the exercise component associated with the RESET program to be very challenging. I could not execute some physical activities to my full potential due to my physical injuries – on my shoulder and on my knee. This caused frustration because of the restrictions in movement on my upper body. However, I continued to challenge myself, week after week with perseverance, strict discipline, unshaken mindset, a firmer commitment and total dedication,” she emphasized. Pooja said she thanks USANA for her “comprehensive transformation”. “For the first time in many years I am now down to a healthy weight and am able to wear fitted clothes to complement my new body shape,” she said. “I am embracing my success of winning the first place in Australia and the countless compliments that I receive from my family and friends. “Throughout my RESET journey I have been fortunate in receiving tremendous support from my family and my TVD uplines Mrs Rita Amarasinghe and Mr Vajira Amarasinghe. Their ongoing words of encouragement never failed to push me to reach higher goals. Continued support from my dear family and TVD team contributed to an essential part of my success”. Pooja said she has now “embarked on a significant life changing journey enjoying a healthier and an active lifestyle”. “With a greater mindset, I have become more conscious of nutritional health, have cultivated sensible eating habits and will continue with a consistent exercise regime,” she said. Pooja said her goal is now to maintain and enjoy her new lifestyle and promote and raise her business to the next level by sharing her success story.